1:51. Good Morning, Wolf, HalT and everyone to follow. Hubby and I met 51 years ago today! His first words to me were, 'Do you want to dance?' - and we've been dancing ever since!!! When I commented about heat vs cold yesterday....yes, I do prefer the cold, BUT, my favorite time of year is Fall. We get some gorgeous color in this area then. Dare I say....awesome? Good heaven's, Arachnid! That sounds like a slapstick comedy movie scene! Not so funny when you are the main characters. I'm glad you and your poor brave wife (and car) are only bruised. That could have been so much worse! Happy First Meeting Anniversary, Shiela! 51 years....I think it's going to last. Everybody!! Wolf seems to have first nailed down! Tiny snowflakes coming down with only slight accumulation so far. They're still guessing we'll get 6 to 8 inches of the white stuff today. I'm glad I can just stay home and look at it through the windows. I wouldn't want the extreme heat you've all been having down under, but I'm picky and don't look forward to our super cold days either. Arachnid, I hope you and your other half are recovered from yesterday's follies. D or A's version wasn't much better! Went 'back in time' to see what Kathy was talking about! Yikes, guys! Arachnid and DoA, I think my first thought was that it was time to call the professionals! What gorgeous horses! I'd love to see this event. 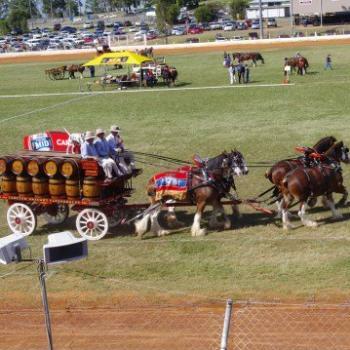 Morning all,the last time I saw these horses pulling a wagon was at Euston, NSW. Arachnid ,who has the most bruises ,you or your wife ? Hope you're doing ok now. A quiet day ahead so I might be able to get Wobats poozle done today. It's a balmy 18*C here at the moment, on it's way to a predicted 25*. I can cope with that. Just perfect for a walk along Howrah beach with Tara. There's a bike/walking track behind the beach - Tara likes that too, there are plenty of bandicoots that get her attention. They are protected but doesn't seem to matter to her. Tight leash required. Off for a walk....Cya, have a great day. Oh Arachnid, leave the wasps alone! The photo reminds me that we have not heard from Heidi from Kentucky in ages. everybody! It's a pleasant 16°C this morning, with a predicted 37°C . But it's heading up to low 40's by end of the week. I'll enjoy while I can. If the hound and I start our walk now, we may beat / dodge the raindrops. No leash here. Eat your heart out Tara. 2:03 Good morning all. Finally made it to the computer as I have family staying with me. Forgot to mention what a lovely photo it is. Shiela, here's to many more years of dancing! Arachnid, that's the kind of story that would be kept 'under wraps' in our family … until - it could be brought out in just such a situation as you did: with an especially appreciative audience! Thanks for the giggles and hugs to the Mrs.! We've already had a good share of the storm's totals & yet, we're told, it hasn't really started yet - groan! One snow-blowing clean-out of the long drive, all porches, walks, steps shoveled; guess we're ready for tomorrow's onslaught! That's a 9-&GT;1 solving puzzle! Good night - off to rest up the shoveling arms! Just havin' a little giggle over Pam's joke. Big event coming up this week....stay tuned!